INDIALANTIC, FL (May 18, 2016) – ASA Entertainment and Six Flags Great Adventure have joined forces to bring top action sports athletes to the largest amusement park in the world. Immediately following the X Games, the same superstar athletes in BMX and Skateboard will fly to New Jersey to compete in a unique team half-pipe competition in front of local fans in the Tri-State Area. The two-day event will be held at the Stunt Show Arena in Movietown on June 11 – 12. The list of participating BMX pros is a “who’s who” of action sports legends, including 16-time X Games medalist Jamie Bestwick, 5-time World Champion Simon Tabron, and 7-time X Games medalist and defending Champion Vince Byron. Some of the Skateboarding stars confirmed to compete include 21-time X Games medalist and defending Skate Vert Gold Medalist Pierre-Luc Gagnon, 5-time X Games medalist Mitchie Brusco, and defending X Games Silver Medalist Paul-Luc Ronchetti. “The Action Sports Tour brings the world’s top X Games athletes for a day of competition among some of the world’s top coasters, and is sure to be one of the most exciting events of the season,” Six Flags Great Adventure Promotions and Special Events Manager, Walter Simon. 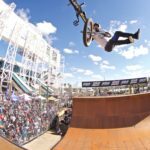 The event format consists of one BMX pro and one skateboarding pro serving as teammates in an innovative format that encourages fan engagement. Each team will battle head-to-head in individual runs, high-air, best trick and team doubles contest. In a twist to the way traditional contests are judged, people attending the event will be provided a voice into how the athletes finish in both the best trick and team doubles events, offering fans the ultimate level of interaction. Tickets for the Action Sports World Tour will start at just $9.99 and will be available at the Stunt Show Arena box office in Movietown or via the Six Flags Great Adventure web site. www.sixflags.com/greatadventure/special-events. To follow the Tour via social media, use #ASAWorldTour and follow @ASAactionsports (Twitter & Instagram) and ASA Entertainment (Facebook). Founded in 1994, ASA Entertainment Group, LLC is an action sports event, television and content production agency focused on creating and executing customized, turn-key marketing programs that range in scale from grassroots to global. ASA’s events, featuring skateboarding, freestyle BMX, inline skating, freestyle motocross, snowboarding, surfing and music, are broadcast domestically on eight networks (including CBS and FOX Sports), and distributed to more than 700 million HH globally via 30 international broadcast partners. ASA’s productions span the spectrum from large, international competitions such as the ASA Action Sports World Tour, the World Championships of Freestyle Motocross, the Supergirl Pro Series and the ASA Big Air Triples to amateur contests, lifestyle and branded entertainment events, demonstrations, exhibitions, school programs and mobile tours. After 22 years as a leader in action sports, ASA Entertainment regularly connects brands to consumers through its platform of premium action sports and lifestyle content. For more information, visit ASAentertainment.com. This entry was posted in Homepage Featured by Taylor Dressler. Bookmark the permalink.